My apologies for the slight delay with this morning's recap, and please excuse any typos. We got in late last night, and I've lost my glasses. We arrived in a doggone monsoon, and at some point while beating back the fire hose they called rain while I ran to my car, my glasses lept into a life raft. But anyway, you're here to read about basketball. Last night's victory over Rhode Island had a little bit of everything, including a new Guinness record for most officiating video replays and an opposing coach who could make a can of Five Hour Energy a sleeping aid. It was a bulldozing win, with no flash nor sizzle but scoring well on the effectiveness scale. Nobody will mistake last night's win with a Beethoven symphony, but it was the kind of game that builds houses. Good basketball teams win that game. Funniest moment: Shaka Smart counting down from 35, in voice and with his fingers, to explain to an official that when the shot clock hits 25, it is a 10-second violation. Picture Smart ticking off the numbers with his fingers in the air, starting with his thumb, in perfect harmony to his voice: "35…34…33…32…31…"
It was a hilarious moment that cracked up even the official, but Smart was very serious. It also is instructive that the VCU defensive energy lacking in the LaSalle loss was present. If college basketball rules said you have nine seconds to cross halfcourt, VCU would've forced about 62 turnovers last night. Havoc was on display and made Rhody uncomfortable all night. Once again, this is the A10, and the league is stocked with guards who won't panic. VCU did force 18 turnovers, including a critical steal from Darius Theus when Rhody pulled to within one possession at 42-39. More impressive to me: the halfcourt defense, which had Rhody retreating on offense all night long. Those Rams scored very well in the open floor but when forced to run offense could not. Rhody finished up scoring less than 1.00 point per possession (0.98). It was VCUs best defensive performance since Duquesne. This game was a matter of the offense catching up with the defense. It was a brutally inefficient first half, with VCU piling up nine turnovers and missing seven of eight three-pointers. Of 12 first half field goals, 10 were made in the paint–mostly Rob Brandenberg or Treveon Graham slashes and rim runs. Juvonte Reddic rebounded from a slow start and dominated the second half, running up 16 points and six rebounds on his way to his fourth double-double in five games. I'd still like to see Reddic demand the ball more in offensive sets, but the game seems to come so easily to Reddic. I wouldn't want him to lose some of that grace for a fictional fiery attitude. In sum, that's a poster child taking-care-of-business road win. There are areas that require attention–19 turnovers is unacceptable–however the overall takeaway is a step forward. Think of the win in the overall structure of a season. Shaka Smart basketball teams get better as the season wears on. This game was a road victory when the team didn't play its best. However they played better than the game before. That's the definition of getting better. Certainly the coaches will work on those things that need improvement, but the ship is sailing in the right direction. Clip-'n-Save 1: VCU played four possessions of zone in the first half and possibly one more in the second half. Rhode Island had a short possession and I didn't write it in my notebook but my mind tells me I think that's what VCU was going to run. The zone, a typical 2-3 look, wasn't particularly good nor bad, but it does gives opposing scouting reports a new dimension. Clip-'n-Save 2: Smart went deep into his bench in the first half. We saw Justin Tuoyo and Teddy Okereafor get some run alongside The Big Buddha and Jarred Guest. Melvin Johnson played a season-high 12 first half minutes. That helped a noticeably-bouncy Treveon Graham (13 first half points) and Darius Theus (all 11 points in the second half). 1-3. That's VCUs output from three in the second half, and the one was Troy Daniels's banker. It's interesting to me that there were only three attempts. I don't know right now if it's part of the opposition gameplan–take away the three ball–or we've chosen to run more offense through the lane. Probably a little of both, but it's worth keeping an eye on. Here's what I do know: VCU scored 41 second half points with just 1-3 shooting from beyond the arc. That makes me smile. Seven, 6.2. Reddic grabbed seven offensive rebounds last night, and now has 31 o-rebs in the last five games. Think about that: Reddic is averaging 6.2 offensive rebounds per game in the past five games. That would be good for 18th in the A10 allowing the other players to include defensive rebounds. Two second-half follow shots were mammoth. I'm feeling better about the offense, but I remain concerned. The primary reason VCU couldn't put away Rhody last night was due to an offense that seemed to step on its own toes too many times. Transition offense didn't help matters. 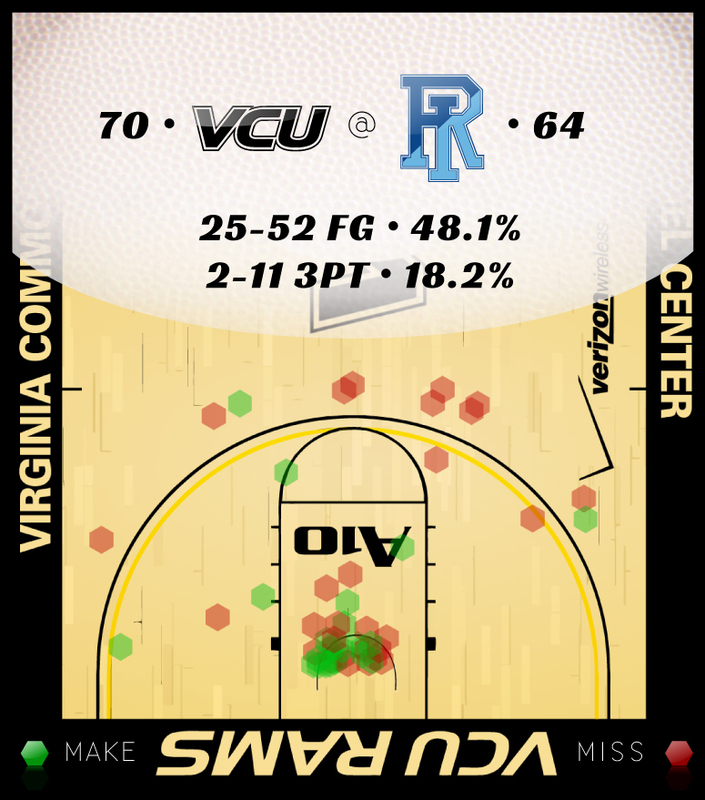 VCU scored just 17 points off 18 Rhody turnovers and one basket–one basket–off the fast break. It's all well and good to score so well in the halfcourt, but if we're shooting threes poorly and not scoring in transition, I worry we are too defendable. Those doggone threes crinkle my forehead. ***Juvonte Reddic. The big smooth (sorry, Sam Perkins) snapped off his fourth double-double in five games with a second-half stat line of 6-8FG, 4-4FT, for 16 points and six rebounds. Simply, he was the best player on the floor (first 10 minutes excluded). **Treveon Graham. When all else was gloopy in the first half, Graham shouldered the load. He had 13 points on 5-7 shooting in just 14 minutes. He continued to attack in the second half, getting to the line eight times and making six. *Darius Theus. He took just one shot in the first half, but Theus was 4-6 in the second half and grabbed all three rebounds. Theus also had a critical steal when the game was getting tight.